Seattle forward Nahomi Kawasumi notched four assists, her team scored four goals in ten minutes and the Reign won 6-2 vs. the Washington Spirit at Memorial Stadium. Kawasumi’s four assists are a new single game record in NWSL history. She also scored a goal, contributing on five of Seattle’s six goals in the game. Through the first 68 minutes, the score was just 2-1 thanks to goals from Seattle’s Christine Nairn and Beverly Yanez, as well as a penalty kick from Washington’s Havana Solaun. But the Seattle offense exploded over a ten minute span in the second half with goals from Kawasumi, Lindsay Elston and two from Megan Rapinoe. Nairn’s goal was her first since returning to Seattle, where she played in 2013. Spirit midfielder Kristie Mewis added a goal for Washington in the 88th minute to make it 6-2. With the result, Seattle improves to 2-1-2, while Washington falls to 1-3-1. Before the game, the NWSL announced that U.S. women’s national team forward Mallory Pugh will be joining the Spirit. She is expected to make her NWSL debut in Washington’s next game, when the Spirit host FC Kansas City on Saturday, May 20 (7 p.m. ET, go90) at Maureen Hendricks Field at the Maryland SoccerPlex. Match ends, Seattle Reign 6, Washington Spirit 2. Second Half ends, Seattle Reign 6, Washington Spirit 2. Attempt blocked. Lindsay Elston (Seattle Reign) right footed shot from outside the box is blocked. Assisted by Katie Johnson. Attempt missed. Tori Huster (Washington Spirit) header from the centre of the box misses to the right. Assisted by Kristie Mewis with a cross following a corner. Corner, Washington Spirit. Conceded by Rachel Corsie. Offside, Washington Spirit. Stephanie Labbé tries a through ball, but Francisca Ordega is caught offside. Hand ball by Kiersten Dallstream (Seattle Reign). Goal! Seattle Reign 6, Washington Spirit 2. Kristie Mewis (Washington Spirit) left footed shot from the left side of the six yard box to the bottom right corner. Assisted by Whitney Church following a set piece situation. Foul by Katie Johnson (Seattle Reign). Attempt blocked. Havana Solaun (Washington Spirit) right footed shot from the centre of the box is blocked. Corner, Washington Spirit. Conceded by Haley Kopmeyer. Attempt saved. Kristie Mewis (Washington Spirit) left footed shot from the left side of the box is saved in the bottom left corner. Assisted by Francisca Ordega. Substitution, Seattle Reign. Kiersten Dallstream replaces Megan Rapinoe. Substitution, Washington Spirit. Alyssa Kleiner replaces Cheyna Williams. Goal! Seattle Reign 6, Washington Spirit 1. Lindsay Elston (Seattle Reign) right footed shot from the centre of the box to the bottom right corner. Assisted by Nahomi Kawasumi. Offside, Seattle Reign. Nahomi Kawasumi tries a through ball, but Katie Johnson is caught offside. Attempt missed. Francisca Ordega (Washington Spirit) right footed shot from the left side of the box misses to the left. Substitution, Seattle Reign. Lindsay Elston replaces Christine Nairn. Goal! Seattle Reign 5, Washington Spirit 1. Megan Rapinoe (Seattle Reign) right footed shot from the centre of the box to the bottom right corner. Assisted by Katie Johnson. Corner, Seattle Reign. Conceded by Stephanie Labbé. Attempt saved. Christine Nairn (Seattle Reign) right footed shot from the centre of the box is saved in the centre of the goal. Assisted by Nahomi Kawasumi. Rebekah Stott (Seattle Reign) wins a free kick in the defensive half. Substitution, Washington Spirit. Kristie Mewis replaces Line Sigvardsen Jensen. Goal! Seattle Reign 4, Washington Spirit 1. 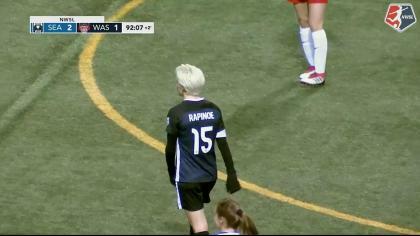 Megan Rapinoe (Seattle Reign) right footed shot from the centre of the box to the centre of the goal. Assisted by Nahomi Kawasumi following a fast break. Attempt saved. Rumi Utsugi (Seattle Reign) header from the centre of the box is saved in the top centre of the goal. Assisted by Nahomi Kawasumi with a cross. Substitution, Seattle Reign. Katie Johnson replaces Beverly Yanez. Goal! Seattle Reign 3, Washington Spirit 1. Nahomi Kawasumi (Seattle Reign) right footed shot from the right side of the six yard box to the centre of the goal. Assisted by Megan Rapinoe. Corner, Washington Spirit. Conceded by Megan Rapinoe. Attempt saved. Nahomi Kawasumi (Seattle Reign) right footed shot from the right side of the box is saved in the centre of the goal. Assisted by Jessica Fishlock. Offside, Washington Spirit. Arielle Ship tries a through ball, but Francisca Ordega is caught offside. Christine Nairn (Seattle Reign) wins a free kick in the defensive half. Goal! Seattle Reign 2, Washington Spirit 1. Havana Solaun (Washington Spirit) converts the penalty with a right footed shot to the top right corner. Penalty conceded by Rachel Corsie (Seattle Reign) with a hand ball in the penalty area. Attempt blocked. Cheyna Williams (Washington Spirit) right footed shot from the left side of the box is blocked. Assisted by Line Sigvardsen Jensen. Substitution, Washington Spirit. Arielle Ship replaces Kassey Kallman. Attempt missed. Megan Rapinoe (Seattle Reign) right footed shot from the centre of the box is too high. Assisted by Nahomi Kawasumi with a cross. Corner, Washington Spirit. Conceded by Jessica Fishlock. Attempt saved. Christine Nairn (Seattle Reign) left footed shot from outside the box is saved in the centre of the goal. Assisted by Beverly Yanez. Offside, Washington Spirit. Shelina Zadorsky tries a through ball, but Cheyna Williams is caught offside. Offside, Seattle Reign. Carson Pickett tries a through ball, but Beverly Yanez is caught offside. Attempt missed. Jessica Fishlock (Seattle Reign) right footed shot from the right side of the box is close, but misses the top right corner. Attempt saved. Havana Solaun (Washington Spirit) right footed shot from the right side of the box is saved in the bottom left corner. Assisted by Meggie Dougherty Howard with a headed pass. Offside, Washington Spirit. Line Sigvardsen Jensen tries a through ball, but Cheyna Williams is caught offside. Attempt missed. Christine Nairn (Seattle Reign) left footed shot from outside the box is high and wide to the left. Assisted by Beverly Yanez. Rumi Utsugi (Seattle Reign) wins a free kick in the defensive half. Attempt missed. Megan Rapinoe (Seattle Reign) right footed shot from outside the box is too high from a direct free kick. Christine Nairn (Seattle Reign) wins a free kick in the attacking half. Cheyna Williams (Washington Spirit) wins a free kick on the left wing. Goal! Seattle Reign 2, Washington Spirit 0. 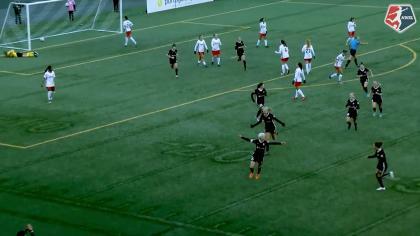 Beverly Yanez (Seattle Reign) left footed shot from very close range to the centre of the goal. Assisted by Nahomi Kawasumi with a cross. Offside, Seattle Reign. Haley Kopmeyer tries a through ball, but Beverly Yanez is caught offside. Attempt blocked. Line Sigvardsen Jensen (Washington Spirit) right footed shot from outside the box is blocked. Assisted by Havana Solaun. Attempt missed. Megan Rapinoe (Seattle Reign) right footed shot from outside the box misses to the right. Assisted by Lauren Barnes. Attempt missed. Nahomi Kawasumi (Seattle Reign) right footed shot from outside the box misses to the left. Assisted by Megan Rapinoe. Attempt missed. Cheyna Williams (Washington Spirit) right footed shot from the centre of the box is too high. Assisted by Havana Solaun with a cross following a fast break. Corner, Washington Spirit. Conceded by Lauren Barnes. Attempt blocked. Beverly Yanez (Seattle Reign) right footed shot from the centre of the box is blocked. Attempt blocked. Beverly Yanez (Seattle Reign) right footed shot from the right side of the box is blocked. Assisted by Nahomi Kawasumi. Goal! Seattle Reign 1, Washington Spirit 0. Christine Nairn (Seattle Reign) right footed shot from the right side of the box to the bottom left corner. Assisted by Nahomi Kawasumi. Foul by Beverly Yanez (Seattle Reign). Foul by Carson Pickett (Seattle Reign). Offside, Washington Spirit. Kassey Kallman tries a through ball, but Francisca Ordega is caught offside. Francisca Ordega (Washington Spirit) wins a free kick on the right wing. Attempt blocked. Jessica Fishlock (Seattle Reign) left footed shot from the left side of the box is blocked. Assisted by Megan Rapinoe. Attempt saved. Havana Solaun (Washington Spirit) right footed shot from the right side of the box is saved in the bottom left corner. Assisted by Cheyna Williams.